Note: I added a ‘follow’ button to the home page of the website so if you like to receive an email notification when a new post comes out just click the follow button and you should get them automatically. 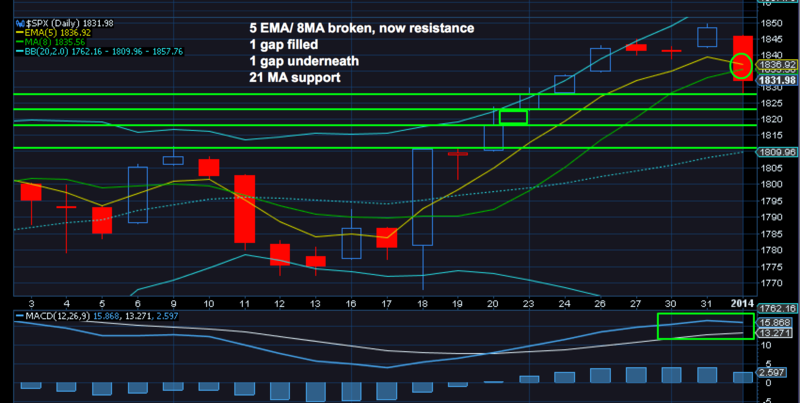 A couple of weeks ago I pointed out how markets do not like to stay away from the 5 EMA for more than 3 or 4 days. Promptly the market disconnected and did something it hadn’t done in many years if ever. It stayed away from the 5 EMA for 8 days! What do you do in a situation like this? You recognize the dislocation and you follow your process. My big problem with chasing outsized moves is that they reverse and it’s never entirely clear when and if wrongly positioned you get run over. In this case the bullish crescendo went into overdrive with everyone getting all giddy about the first trading day of January being up another 1%. Right. I kept my scaling process going with my thesis of tax consideration being principally responsible for the dislocation (no sellers). Following the process was then finally rewarded with the $SPX erasing 5 days of gains in one day re-connecting with the 5 EMA in the process and taking out the 8 MA for good measure as well. If you weren’t positioned for this move it was tough to catch. Dip buyers were hurt in the process and people scratched their heads how it could be that the market actually went down. Please. It is quite simple. People took profits and the key question is how much profit taking there will be before we see a tradable bounce. As the chart shows there are two immediate magnets lower, the gap fill and the 20 MA area which coincides with previous market highs hence making it a solid support zone. To me this would be an ideal zone to play long for a bounce. POMO is back in force next week with a large on on Tuesday. So ideally we would hit this area by then for short term oversold readings. Yet it is Friday which have trended bullish on Fridays and dip buyers are still eager, so it really depends on the profit taking selling pressure. I re-insert the 2000 chart here again as a reference to show how profit taking can garner momentum quickly, and we simply do not know how this will play out. Bottomline January promises lots of volatility with a likely re-test of the highs at some point and further downside at the same time. My process remains the same, I will take profits as they arise and will position long once we have signals to do so. If you want to play aggressive long today on weakness (i.e. next gap fill) it may be a good intra-day play. However, note that the MACD just started turning, but hasn’t crossed yet. I like to long on the opposite play (it crossing over from oversold). For now this is shaky, probably choppy and only day 1 and it’s a Friday with volumes still low. Overnight the lows were near $1820 $ES and we are now 10 points above that. So no reason to push things one way or the other other than scalping. We may also see another test of the 8MA and 5 EMA which may be a good zone to re-enter some puts if it were to occur today. But I’m not really interested in entering trades here in the middle. Re: Metals. We had a nice initial bounce yesterday following Tuesday’s reversal and shorts haven’t really been forced to cover yet. 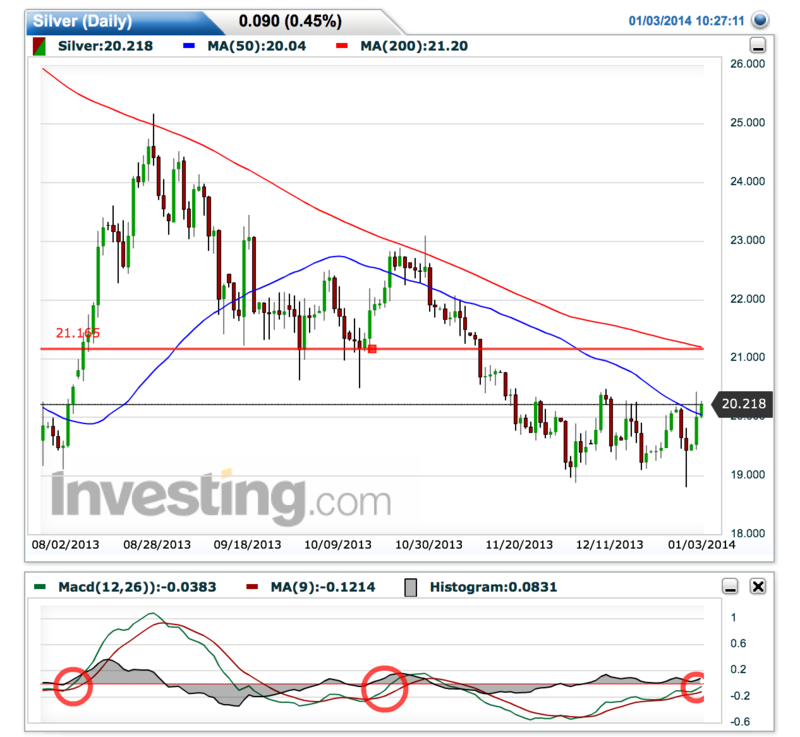 I like this $SLV futures chart as it outlines a likely magnet area. Note we are close to a MACD cross-over. The past 2 times have resulted in a tag of the 200MA. This is will be my target zone to exit my call positions as it also coincides with very strong previous support which will also add to the resistance in this area. So I expect at minimum some chop in that area and possibly a retracement, either one of which will result in decay of premium. The flip side of the trade remains failure to break through resistance and as long as equities find bidders this resistance will likely remain a challenge. For reference also check the $GDX chart below as it has some of the same structural elements.